Grades 4-6. Designed to be completed throughout the school year, this collection of whimsical yet sophisticated worksheets is perfect for creating student keepsake journals. 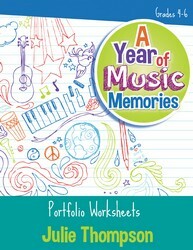 Keeping music-learning as the focus, these reproducible worksheets will appeal to students on a personal level while also encouraging them to write. Activities that cover state and national standards have never been so much fun!